Yes, it's harvest time down at the bumper farm! Grab all the ripe red bumpers from the field! casual game for the PC. Use the D-Pad to aim the ball launcher left and right. Hold down L to fine-tune your aiming. Fire the ball by pressing X.
field. 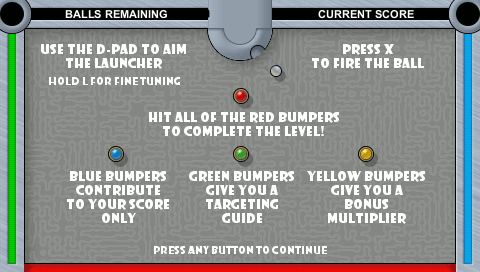 Hit all the red bumpers to progress to the next level. Red bumpers are worth 200 points; all others are worth 100 points. Green bumpers give you 3 targeting guides each. There are two on each level. Hold down R while aiming to use a targeting guide. Guides are not saved between levels, so use 'em or lose 'em. The yellow bumper gives you a bonus score multiplier. There is one on each level. All bumpers hit after the yellow bumper on the current shot are worth 10 times their normal score. There are also two fixed bumpers on each level which are simply obstacles, and two active bumpers which give the ball a boost. 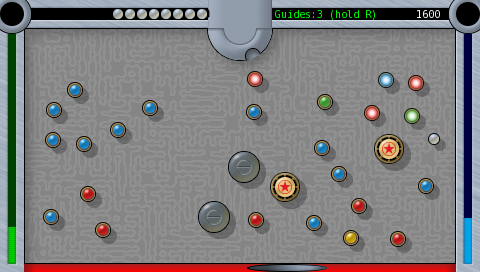 At the bottom of the screen is the return chute, which gives you a free ball if the ball lands in it at the end of the shot. I'm happy with the way it's turned out, but I've cut it pretty fine. 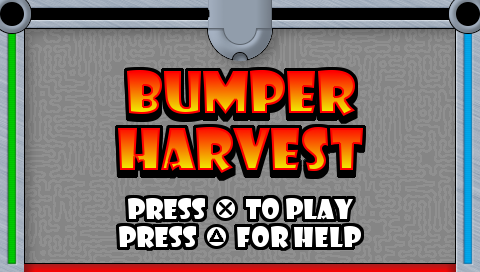 Bumper Harvest is written in Lua. The current version is a self-contained app using LuaPlayer 0.20, and installs the same as any other 1.5 app. Unfortunately this means the PSP Slim is not supported. If I get time before the closing deadline I'll try and upload a version using LuaPlayer HM, but it's giving me some trouble with sound right at the moment. UPDATE 1: Well that wasn't so hard. One line to re-enable the old sound system! The new version uses LuaPlayer HM3 so it should work well on all PSPs. It has been tested on Phat 3.71 M33. I couldn't get it to load MP3 versions of the sound effects, so it's still just over 2MB. Install the same as any other app to the PSP/GAME or PSP/GAME3xx folder. Original post updated with support for all PSP versions, via LuaPlayer HM3. hey!this game is very good;) good work! Is this optimized for SLIM PSP's ram? It does run a bit slower than I'd like, I didn't have any time for further optimisation. But it should still be totally playable; game time is based on frames not seconds, so it should play the same at any speed. I'd say this game is great fun. The only thing that needs to be changed imo is the guide line. The graphics on the game are nice except that ugly green line. Could really benefit from a nicer looking line to compliment the graphics. Revised targeting guide graphics to be sprite-based. This returns the guide to the original dotted-line style, but now all graphical elements can be themed via the sprite files. This is a very minor update to the game, but it is after the deadline so I'll leave it up to the judges as to whether this version counts. I think that's definitely more of a change than I could get away with after the deadline. EDIT: Last update says the download is missing from your server.